In appeared the question: How can I explain the dimension idea, without step in a hard topology frame, but further of the Euclidean simplicity? Here is a slightly expanded version of my answer given there. Dimension is surprisingly hard to explain on a calculus level without escaping to topology or measure theory. Related is the concept of a boundary which appears also not to be easy to grasp. The concept of boundary turned out to be one of the more difficult problems in a recent final exam [PDF]. In calculus, a geometric space X in is constructed either by writing X as a level set of a in general nonlinear map f from to or then as the image of a in general nonlinear map from . In the first case, one expects X to have dimension . In the second case one expects X to have dimension m. There is some justification that this happens generically. In the first case there is a theorem of Sard which shows that in smooth situations, the rule of thumb dimension is correct. (Apropos Sard: regularity also works in the discrete article). Also in the second case, for generic real analytic parametrizations, the singularities are in general of little consequence so that the image has dimension at almost all point. But the “rule of thumb dimension” is a good starting point: a single equation in 3-space defines a 3-1 dimensional surface in general, m=2 equations in a 3-space define a 3-2 dimensional space in general. If we parametrize a space by one parameter, we get a curve, a one-dimensional set, if we parametrize a space by m=2 parameters, then we get a m=2 dimensional surface, in general. Dimension is best explained at first with concrete examples: isolated points have dimension 0, curves like a line or circle have dimension 1, surfaces like the unit sphere in 3-space have dimension 2, solids like solid balls in Euclidean 3-space have dimension 3. It can surprise at first that the solution set to a single equation can lead to different dimensions: is one dimensional and is zero dimensional, while as an algebraic set has points were some unit spheres consist of two intersecting circles. An equation like can even have the entire Euclidean 3-space as its solution space. One can explain dimension as the “the number of parameters needed to describe the space”. This has caveats: the parametric surface is one dimensional. One needs to explain then that can not be zero on too large spaces but this leads to other problems like the parametrization of a cone which has points, where is zero. One has to make assumptions on the nature of the singularities, the places where the rank of the linearization maps are smaller than expected. A parametrization might look m-dimensional but there might be some large set of singularities which are not visible by looking at the equations. The Hausdorff dimension requires some real analysis background. It is a dimension for metric spaces and not a topological invariant as it can change under homeomorphisms. One can push it into intro classes like Handout for Math21b, 2004, Handout from Math 118r, 2005. One first defines the (s,r)-volume as the infimum over all where the sum is over a cover with cubes U of diameter of X, |U| is the diameter of U and the infimum is taken over all such covers. The s-volume is the possibly infinite limit when s goes to 0. The dimension is the unique limiting value s, where the s-volume jumps from 0 to infinity. The notion is not quite intuitive as one has to look at the class of all possible coverings, take a limit and then see a threshold value for s. It can be simplified by taking balls or cubes of fixed size. In many cases, the dimension can be computed more easily. In simple self-similar cases, the box counting dimension can be explained well without limits. It is the vulcan dimension , where n is the number of boxes of size r needed to cover the set and the limit is taken for n going to infinity. It is a kind of box counting dimension but is especially simple if the numbers n and r can be given explicitely. The dimension is learned by Spock in this movie. The vulcan dimension is accessible to students who have not seen calculus yet. It works well for linear spaces or manifolds or self-similar fractals like the Sierpinski triangle or carpet, the Menger sponge, the Cantor set or the Koch snowflake. For the Menger sponge for example, one needs cubes of size . Its vulcan dimension is . The Cantor set needing cubes of size giving is the prototype. A worksheet with some examples is here [PDF]. The Hausdorff-Uhryson dimension is a topological notion but it is integer valued. Start with , then define the local inductive dimension dim(x) in X as the smallest k such that for every neighborhood U of x, a neighborhood V of x such that has inductive dimension . The inductive dimension of X is then the maximum of all local dimensions x. A k-manifold has inductive dimension k. A discrete metric space and especially a graph with geodesic distance metric has dimension 0. A graph equipped with the 1-dimensional skeleton complex has dimension 1 if one looks at the geometric realization where edges are “wires” connecting nodes. Its important to note however that this is a very narrow point of view. It is a bit as if we would look at the discrete topology on the real line (which is zero dimensional). The natural simplicial complex structure on a graph is the Whitney complex given as the abstract finite simplicial complex for which the subsets of a vertex set are the complete subgraphs of the graph. The dimension for a finite simple graph is defined as 1 plus the average of the dimension of the unit spheres S(x). The dimension of the empty graph is -1. 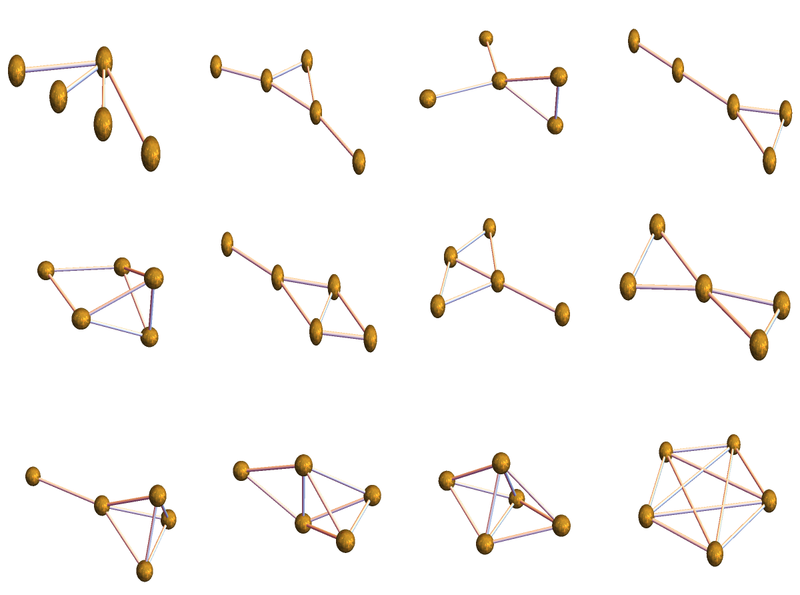 The dimension functional takes 12 different values on the set of 728 connected graphs with 5 vertices. Here are the 12 representatives again. (It is a figure given in this article). 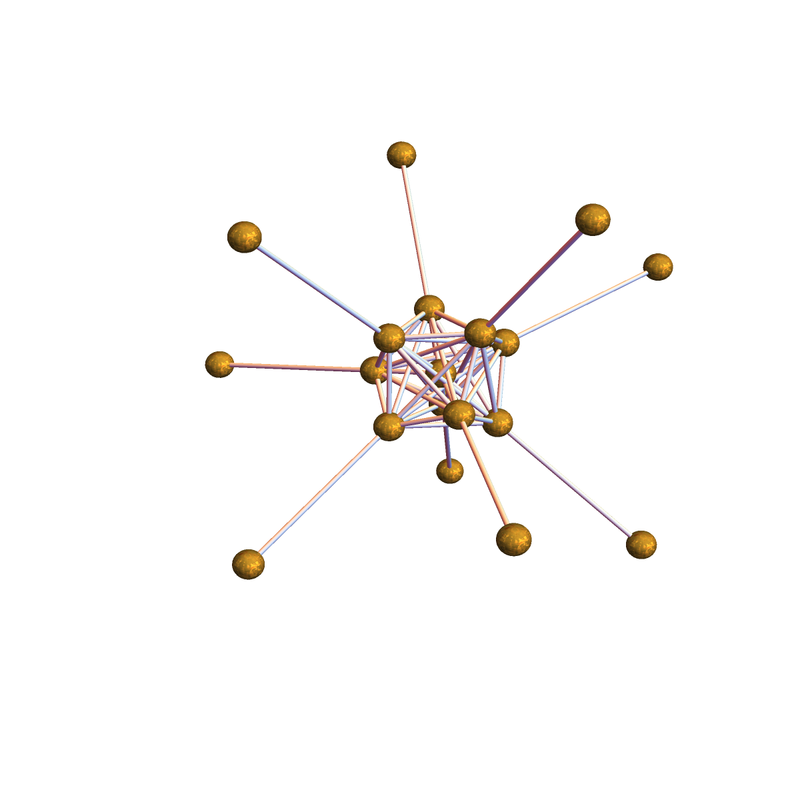 The inductive dimensions of the graphs in this figure are 1,4/3,7/5,22/15,23/15,5/3,17/10,2,49/20,79/30,3 and 4. The dimension functional on graphs with n vertices takes dimension between 0 and n-1. A picture of a 4-dimensional space can be obtained by drawing 5 points and connect all with each other. This defines a 4-dimensional simplex. Why is it four dimensional? Because all unit spheres are 3 dimensional simplices (tetrahedra=K4). Why is a tetrahedron 3-dimensional? Because all its unit spheres are triangles (two dimensional). Why is a triangle two dimensional? Because all its unit spheres are intervals. Why is an interval one-dimensional. Because all its unit spheres are isolated points. 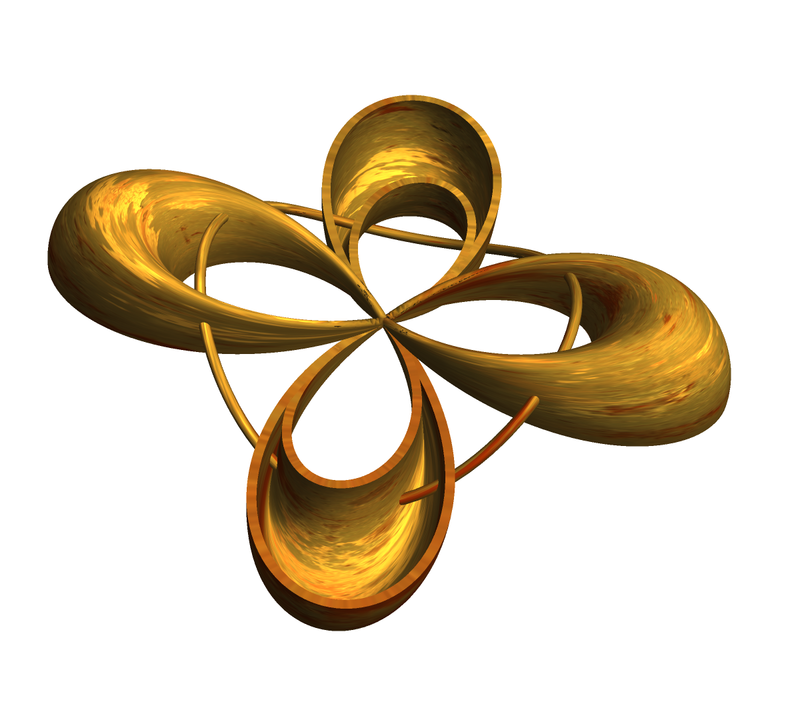 Why is an isolated point zero dimensional? Because all its unit spheres are empty. Now lets look at a visualisation of the three-dimensional sphere. We don’t mean the 2-sphere bounding the three dimensional ball but the 3-sphere, which is a three dimensional space usually thought of as embedded in a four dimensional space and realized for example as x2 + y2 + z2 + w2=1 or as the set of unit quaternions. In the discrete, the simplest 3-sphere is the 4-cross polytop. It has 8 vertices. We can realize that sphere nicely by drawing 6 vertices on a circle and two inside. On the circle, connect all except opposite ones. Now connect all two inner vertices with all the vertices on the circle. A better picture is to let the vertices be the corners of a cube. Now connect along the edges of the cube and along the diagonals. Why is the cross polytop with 8 vertices a three dimensional sphere? The reason is that removing one vertex renders it contractible and because every unit sphere in that graph is an octahedron graph. 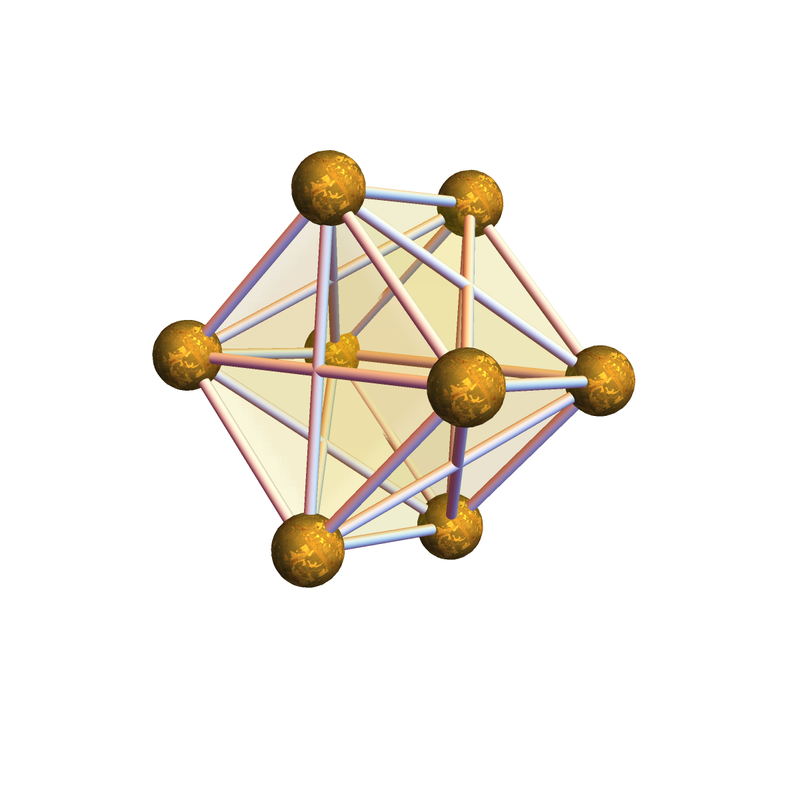 Why is an octahedron graph a two dimensional sphere? Because removing one vertex produces a wheel graph, which is contractible, and because every unit sphere is a circular graph C4 which is a one-dimensional sphere. 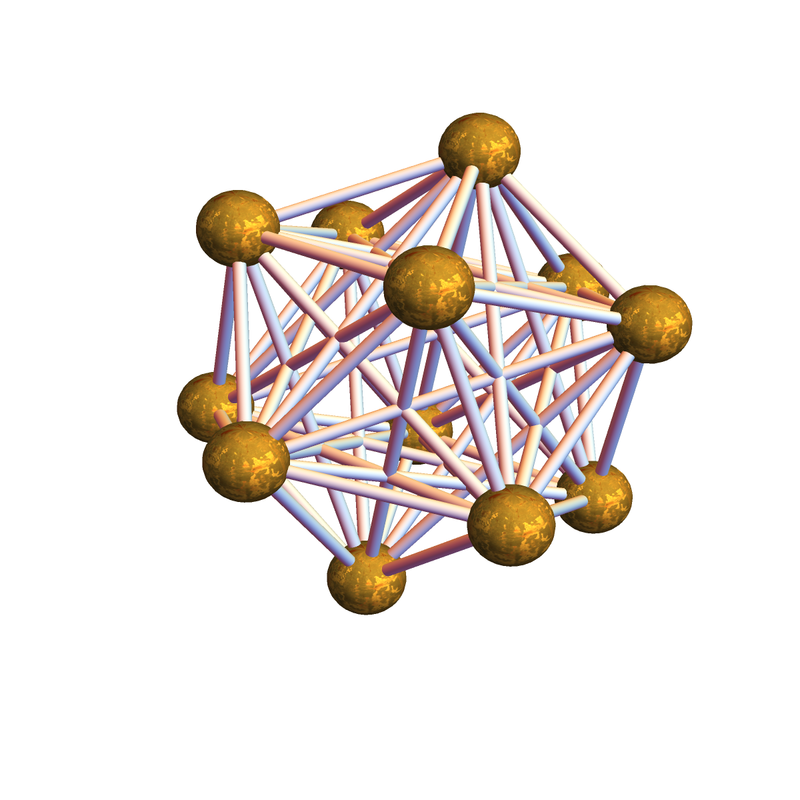 Why is a C4 graph a one-dimensional sphere? Because removing one vertex renders it contractible and because every unit sphere is a 2 point graph without edges (which is a 0-sphere). Why is the later a 0-sphere? Because removing one vertex renders it contractible (it is a single point) and because every unit sphere is the empty graph (a (-1)-dimensional sphere. The f-vector of the 3-sphere is (8, 24, 32, 16) meaning that there are 8 vertices, 24 edges, 32 triangles and 16 tetrahedra (complete graphs K4) in this graph. The Euler characteristic is the “super sum”, which is 8-24+32-16 = 0. Its not only that 3-spheres always have Euler characteristic 0, every 3 dimensional discrete manifold (a graph for which every unit sphere is a graph theoretical 2-sphere) has this property. There is a general Gauss-Bonnet-Chern theorem for graphs. The curvature of the 3-sphere is constant 0 everywhere. This turns out to be true in general for any 3 dimensional geometric graph. This is proven here using probabilistic methods: the curvature is the expectation of Poincare-Hopf indices. It turns out that one can see this zero curvature result also as a special case of the Dehn-Sommerville relations extended here to multi-linear valuations. There are two reasons why the inductive dimension for graphs is natural: 1. It satisfies the dimension inequality for graphs, where the product of two graphs G,H is defined as the graph with vertex set (x,y) where x is a complete subgraph of G and y is a complete subgraph of H and where two vertices are connected if one is contained in the other. The dimension inequality was proven in this paper. Interestingly, it had to be generalized in order to get a simple proof. A second result is that we can compute the expectation value of dimension on Erdös-Rényi probability spaces as given here. The inductive graph dimension for graphs is not the same than the inductive Menger-Uryson for metric spaces, as the later assigns always the dimension 0 to graphs (natural finite topological spaces on graphs are usually discrete topologies). The inductive dimension is well suited for simplicial complexes in the sense that one can prove nice theorems. The case of abstract finite simplicial complexes is a bit more general: define the dimension of a point $x$ in a simplex abstractly as 1 plus the dimension of the simplicial complex generated by all simplices which are sub or sup complexes of $x$. In full generality, this inductive dimension satisfies the dimension inequality which is known for Hausdorff dimension. But now, we are in a completely discrete setting. One can also compute the expectation of the dimension functional on Erdoes-Renyi probability spaces of graphs. There is a continuum analogue of this in arbitrary metric spaces (X,dist,mu) equipped with a nice probability measure mu: one can define the r-dimension as 1 plus the expectation of the r-dimension of the r-spheres. Dimension is especially powerful together with homotopy as homotopy and dimension allows to define inductively what an abstract sphere is (Evako sphere). The notion is quite powerful and works in usual geometric situations like the Brouwer-Jordan-Schoenfliess situation see this paper. The maximal dimension of a graph G is the dimension of the Whitney simplicial complex on G. It is the length of the $f$-vector minus $1$. The dimension of the complete graph is . More generally, if a graph is equipped with a simplicial complex C, then its dimension is the dimension of that simplicial complex, the dimension of the largest complete subgraph in the graph. A graph equipped with the k-dimensional skeleton complex is k-dimensional. The Erdoes-Hararay-Tutte dimension of a graph is the least k such that the graph can be embedded into Rk in such a way the Euclidean distance between two adjacent vertices is one. The complete graph Kn has dimension n-1 but a wheel graph already has dimension 3. The Covering dimension of a graph is the minimal k such that every open cover of $G$ has a subcover such that no point is included in more than k+1 elements in the cover. The Wiener dimension of a graph is the cardinality of the image of the map . The dimension of every complete graph is 1. This dimension was introduced by Alizadeh and Klavzar in 2012. As mentioned before the small inductive dimension of a graph is $0$. Define an abstract d-manifold as a compact metric space (X,d) for which small enough unit spheres are abstract (d-1) spheres, An abstract d-sphere is a d-manifold which when punctured becomes contractible in some homotopy sense. The notion of homotopy also goes over abstractly to discrete cases by defining it inductively: a homotopy step either adds a point to a contractible set or removes a point with contractible sphere. [On graphs, this leads to Evako homotopy and Evako spheres.The Evako homotopy has essentially been introduced by Whitehead but as far as we can see, before Evako, one always referred to Euclidean realizations. Staying completely and maybe Brouwer fanatically in the discrete so by rejecting the notion of infinity has advantages in that one stays close to computer science. ] On general metric spaces, the notion of d-manifold will depend on the chosen notion of homotopy. The local r-dimension at a point x can then be defined as , and the maxima inductive dimension of a metric space can be defined as the maximum of all dimensions , where x ranges over X. For Riemannian manifolds, the r-dimension and Hausdorff dimension agrees with the classical dimension for small enough positive r.
The empty set is a metric space with dimension -1. A metric space (X,d) has dimension k if every small enough sphere S(x) with induced metric is a metric space of dimension k-1. An isolated point has dimension 0 because sufficiently small spheres have dimension -1. A curve has dimension 1 since if we take a point x on this curve and look at all the points in a small distance r from x, this is a discrete point set of dimension zero. A surface like the sphere is two dimensional because if we pick a point, and draw with a ruler the set of points with fixed distance from this point, then we get for small nonzero r a circle which we have already established as having dimension 1. More general is a metric space equipped with a nice enough probability measure which we call inductively “nice” if it induces nice measures on small enough r-spheres. Now we say $x$ has dimension k if has dimension k-1. With this more general notion, the dimension can also take fractional values. It has still to be explored whether this dimension gives Hausdorff dimension. Adapted to graphs, when taking the normalized counting measure, it becomes the inductive dimension for graphs discussed above. Here is a version with fixed radius r. With “nice” we mean that the conditional probability on every Sr(x) (defined as a weak limit of the induced probability measure on has a unique limit for and that this probability measure on is again nice for every x. If we work with a fixed radius r (think about it as a Planck constant), then we have to rescale the metric induced on spheres so that r is again small there. Otherwise we run the risk that the spheres become eventually empty. The empty set is a metric space X with r-dimension -1 equipped with a probability measure. Assume the metric is rescaled so that diameter of X is 1. The local r-dimension dim(x) of X at x is the 1 plus the dimension of Sr(x). Inductively we always assume the new metric on spheres is rescaled so that the diameter is 1. The r-dimension of X is the expectation value of r-dimension random variable dim(x). For compact Riemannian manifolds and small enough r, the volume probability measure is a nice measure. It induces nice measures on geodesic spheres, which are again nice Riemannian manifolds equipped with a nice measure. As mentioned, we rescale the metric on each sphere to be able to continue with the same r.
For a finite simple graph and r=1, we get the inductive dimension defined above. Is there a dimension inequality for r-dimension? Can one show that the Hausdorff dimension can be obtained as a limiting case, possibly averaging over small r and taking a limit? This would link inductive and Hausdorff dimension on a general level and especially reprove the above dimension inequality. In any case, dimension and homotopy together can characterize Euclidean spaces or locally Euclidean spaces like manifolds. But it is more general. Dimension, paired with homotopy allows to define spheres and so spaces which are of Euclidean type. This works well in Riemannian manifold or graph cases. It is however more generally applicable for metric spaces.